When I met Angel Guillen last September at a dusty baseball diamond in Maracay, Venezuela was a spindly 15-year-old pitcher with a whip for a right arm and big dreams drawn to scale. I visited him while reporting a feature on Venezuela’s role in the global baseball-industrial complex, getting to know kids who hoped to become part of the next wave of criollos to become pro ballplayers in the U.S.
Guillen planned to reach the major leagues by 20, and hoped to hit 90 mph with his fastball by this July, believing that milestone would bring him a six-figure contract with a major league team. The cash would enable him to buy a new house for his mom and siblings. He lived with them in barrio in a nearby town called Turmero, and wanted to move his family into an urbanizacion. When I asked his coach, Alexis Quiroz the difference between a barrio and an urbanizacion he shrugged. Very little besides the name. It’s like a slum dweller dreaming of moving up into the ghetto. An important distinction for him, even if people outside that word can’t detect it. For now, however, Guillen is dealing with a different change in scenery. Last month he signed a contract with the Washington Nationals, who paid him an $80,000 bonus then quickly shuttled him to their facility in the Dominican Republic. He’ll spend the next year training, then take the mound next summer with the Nationals’ Dominican Summer League team. Guillen’s signing wasn’t the highest-profile among teenage Venezuelans. 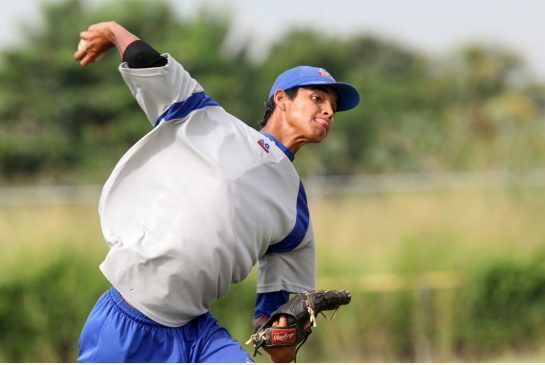 Yeltsin Gudiño apprenticed at an academy run by former Detroit Tiger Carlos Guillen, across the street from the public park where Guillen and his classmates did their nightly sprint training. In July he signed with the Blue Jays for $1.2 million. Those sums are even more remarkable given that big league teams face steep taxes for exceeding a $2.9 million cap on total signing bonuses. After signing a premium player for seven figures, dividing the remaining pool among other prospects becomes complicated and players like Guillen — talented but a notch below the top tier — hustle for as large a contract as a team’s budget will allow. Will his deal allow him to buy his mom a new place? Possibly, though in Venezuela’s turbulent economy it’s tough to tell just how far that money will stretch. And will he grow into a pitcher capable of debuting at Nationals Park by within four years? Maybe, assuming his frame fills out and he learns complimentary pitches and keeps figuring out how to handle batters who improve exponentially at each level of the minor leagues. The reality is, a five-figure bonus at the bottom rung of the Nationals’ minor league ladder doesn’t guarantee anything except an opportunity. But that’s way more than he had when I met him in September. ← Ignore this page. just testing something.